When I started my ministry as a priest, I served in a large parish as an appointed curate. The Episcopal Church is often known for its unusual nomenclature, but curate was still a word that would elicit many questions when I mentioned my new position. I quickly had to come up with an elevator speech. I learned to tell people that “Curate comes from the Latin word “curia” and it is the job of the curate to cure souls.” Now that little elevator speech often shut down conversation. For rarely is it polite to mention souls and the curing of souls in contemporary culture. 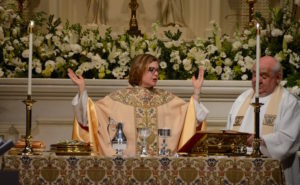 But, truly a curate is a newly ordained priest who has the chance to see the full realm of ministry from birth and baptism to last rites and death–and everything in between. When I was called to be the associate rector, I was charged with priestly oversight of the pastoral ministry. My vision for this ministry continues to be the cure of souls. The primary work of the church is to be the church–that is to proclaim the Gospel and celebrate the sacraments. And, so, it makes perfect sense that in being faithful to a life that is shaped by the sacraments, the cure of souls takes place. As parents seek a life of faith for their children, we usually form that in the shape of the sacrament of baptism. In the Episcopal Church, we celebrate the sacraments of baptism and Eucharist as a way of life for Christians. Both of these are communal and public events. But then we have many pastoral offices available for the people of God, which can often be private occasions with guidance from the clergy. We privately offer the reconciliation of a penitent (confession), celebration of a marriage, anointing of the sick, last rites, and of course, the Burial Office. All of these pastoral offices reflect the life cycle of which we humans are a part. We may not have need for all of them; they range from joyful to painful, but they are all points in which we can be brought into the nearer presence of God. Pastoral care focuses on the presence of God working in our lives. Our Pastoral Care team takes seriously our call to be the hands and feet of Christ. We bring communion to the sick and the homebound. We deliver altar flowers on occasions of thanksgiving and concern. We bake bread and cook meals for those in need. We knit prayer shawls for those sitting in hospital beds or alone at home. We gather for prayer every week interceding for all the faithful. And, we write notes to those who would find comfort knowing they have not been forgotten. A month ago, I had the rare gift of happening upon Wayne Borges as he was in the last days of life. Craig Jurgensen expertly guided me in understanding the patterns and rhythms of his labored breathing. I pulled out the Book of Common Prayer which was right at his bedside. I anointed him with holy oil so he would be reminded of God’s nearer presence as we smelled the myrrh in the oil. And then Craig grabbed a framed hymn off his wall–Dickinson College. Together we sang this song to him as we marked his entrance into the land of light and promise. Pastoral Care brings us into the presence of God in a profound way. I invite you all to experience the treasure which is pastoral ministry at St. John’s.